Available at the Leonard L. Williams Justice Center parking facility which is located next to the courthouse. The parking facility may be entered on either Walnut Street (on the left-hand side after crossing 4th Street) or King Street (left turn after passing Wilmington College). Handicapped parking is available in the parking garage. 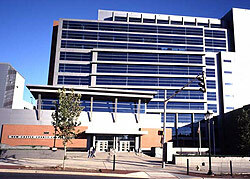 The Courthouse has ramp entrances and automatic doors. Additional parking is available to members of the public when the Courthouse Parking Garage is full. View a list of parking lots and garages in close proximity to the courthouse and their daily rates.